By installing flexible Magnelab current transformers in combination with eGauge real-time electricity monitoring devices, St. Vrain Valley School District (SVVSD) has been effective in pursuing advanced energy conservation and behavior programs. If executed properly and comprehensively, conservation efforts have the capacity to save considerable funds for an organization as well as offer tremendous educational opportunities. SVVSD has learned and evolved since the late 1990’s to embrace the power of translating energy data to operational and behavior change measures and the benefits are both quantitative and qualitative. In particular, over the past 5 years, SVVSD’s Energy & Sustainability Department has progressed by leaps and bounds to institutionalize energy management strategies and engage building occupants and community members. Various initiatives have included ReNew Our Schools, the Resource-Wise program, retro-commissioning, lighting upgrades, and HVAC schedule improvements, all of which have helped the district achieve many goals such as reducing energy consumption and carbon emissions, minimizing utility costs, and educating stakeholders. However, the success of these programs and efforts would have been limited without the ability to easily view and access real-time electricity data. It became quickly apparent that installing eGauge devices with Magnelab Current Transformers would serve the district now and well into the future. The Energy & Sustainability Department aims to identify and implement energy efficiency and sustainability initiatives that benefit and educate the St. Vrain Valley School community at large. The objective is to reduce costs, conserve natural resources, and engage deeper with the community. Catalyzing real change takes time and committed buy-in at all levels of an organization. Thus, the Energy & Sustainability Manager regularly seeks out internal and external partnerships to develop meaningful programs and optimize project implementation. Participating as the sole district in the Center for Resource Conservation’s ReNew Our Schools energy competition back in 2013 was an ideal mechanism to advance our mission and vision and foster long-lasting support of conservation measures. Additionally, the competition shed light on the significant value that Magnelab CTs and eGauge monitors provide given that these tools were installed in all participating schools. The district hosted ReNew Our Schools again in 2014 and 2015 with each round highlighting challenges, lessons learned and numerous solutions to school system energy inefficiencies. Through these energy competitions, the district installed eGauge monitors at 31 schools and by June 2015 furnished the remaining 17 sites with the devices for a total of 48 district-wide. The accurate depiction of electricity use at each building has opened many doors from an educational and operational perspective. For instance, the Energy & Sustainability Manager started a year-long conservation program in 2014 called ‘Resource-Wise’ which includes in-depth training, resources and incentives as well as educational materials to meet Colorado state curriculum standards. The eGauge and Magnelab devices also provide insight into program or equipment issues and support numerous worth-while investments in building infrastructure and equipment such as LEDs, remote thermostats, sensors, day-lighting, renewable energy and more. The month-long ReNew Our Schools competitions were effective in jumpstarting in-depth and far-reaching energy and sustainability initiatives throughout the St. Vrain Valley School District. Participating schools received toolkits, training, resources, materials and district support. In addition, SVVSD’s Energy & Sustainability Manager developed a mentor program whereby local energy professionals were assigned to schools to provide guidance and recommendations. important lessons around reducing electric loads. For schools new to or familiar with the concepts of conservation, the real-time data is a powerful step in addressing how and when their school uses electricity. This real-world exploration lends itself to valuable long-term possibilities both inside and outside the classroom. The most critical piece in understanding how building occupants can conserve better is to acquire knowledge of the existing energy profile. Students, teachers and staff who receive anywhere from basic to advanced training around the eGauge tool acquire 21st century skills by analyzing data and evaluating utility information to drive solutions. During the 2013, 2014, and 2015 ReNew Our Schools energy competitions, schools viewed eGauge data to determine whether conservation efforts were successfully reducing electricity consumption. Through partnering with the Center for Resource Conservation and Cube Resources, user-friendly dashboards were produced for schools to view savings progress. These online displays extracted eGauge data to develop predictive, weather normalized baselines for each school during the competition. manipulating HVAC schedules. While walking around the school, students could view their building’s energy consumption on any portable internet device as shifts occurred such as turning off gymnasium lights. Seeing in real-time how the watts jump up or down depending on electricity usage provided the viewers with considerable insight. Students understood that adopting small changes such as minimizing lighting and plug loads and reducing energy hogs could lead to bigger results. 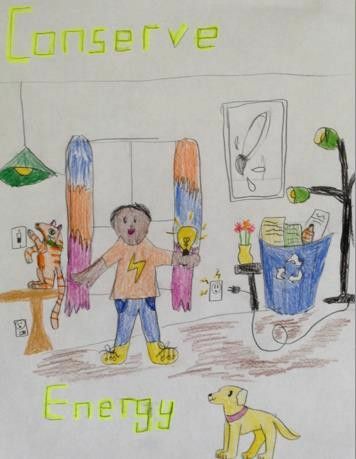 A few schools adopted ‘black out lessons’ where each classroom projected the eGauge and turned off all the lights at the exact same time so the students could see the large electricity reduction happening live. Students and teachers alike found this exercise fascinating as it showed them how they could in fact impact their environment and in this instance, the amount of energy that goes toward lighting. Realizing how behaviors affect the surrounding environment motivated students, teachers and staff to take advantage of daylight rather than overhead fixtures, unplug equipment, remove personal appliances and pay attention to HVAC schedules. The eGauge data allowed users to evaluate patterns and anomalies in building consumption and consider how to optimize heating, ventilating, and air conditioning programming. For example, several schools identified school start times, peaks, and end of school shutdown times. These observations led to questions around schedules and inefficiencies. Students requested later start times, earlier shutdowns or even reduced the air conditioning or heating set-points to reap even greater savings; slight adjustments that were not felt by the building occupants and did not have any impact on the learning environment. Other schools that may not have had flexibility in startup and shutdown times noticed energy waste that they could influence pertaining to computer labs and lighting. Through these conversations, the district has implemented two procedures. Custodians are asked not to turn on any classroom lights or areas not being used in the early mornings as well as only turn lights on when a particular space is being cleaned. And District Technology Services implemented the Computer Power Management Initiative so that computer labs are manual on and automatically turned off at the end of the school day to reduce electricity usage and ensure that labs are not left on for extended periods. In addition, the Energy & Sustainability Manager was able to leverage the newly established stakeholder buy-in to produce the district’s first Energy Conservation Policy. In total, 38 schools competed in ReNew Our Schools over the three years (14 in 2013, 12 in 2014, and 12 in 2015). The kilowatt-hour and dollar savings results captured over the one month competitions were impressive. implement conservation measures and sustainability efforts. professional development salary credit or a stipend for participating and were tasked with attending a mandatory training, creating a committed student group, conducting energy audits, utilizing various tools and resources, and submitting a final written report. Cube Resources provided technical support and developed dashboards to display weather-normalized baselines for each school as seen below. The black bars represent the expected daily electricity consumption in kWh and the green bars equal the actual usage. 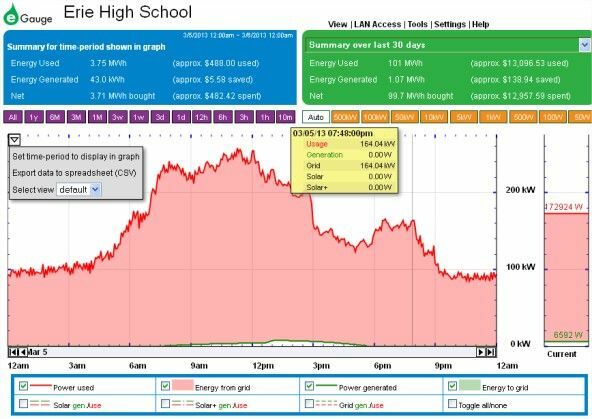 During the first month of recorded savings, Sunset Middle School achieved 13% electricity savings below baseline. In just 3 months of measured savings, with only 3 schools participating in the pilot, nearly 44,000 kWh were saved. More importantly, the operational and educational benefits surpassed expectations. Students gained competencies to determine energy efficiency opportunities, examine data, develop strategies for reducing electricity usage, and translate findings into real-world action. Furthermore, students were exposed to STEM (science, technology, engineering and math) applications and career paths which align with SVVSD’s mission and vision. Schools also have the option to pursue additional projects for credit pertaining to waste, water, environmental quality, and green school site. The Resource-Wise program became an official offering the following year (2015-2016) with 8 schools participating, saving 82,000 kWh over 4 months. During the 2016-2017 school year 13 schools participated, saving 84,000 kWh over 4 months. Although the average reduction was lower per school, this is due to a downward shift in the baselines for 6 schools who participated in the prior year. As the graph clearly depicts, Sunset Middle School’s baseline has improved over time which is primarily due to student and teacher led efforts including delamping, a reduction in plug loads, energy efficiency upgrades, behavior modifications, and mechanical system optimization. The baseload has dropped by about 30 kW and peak demand by as much as 40 kW. Another enlightening example of schools interacting with Resource-Wise tools took place at Eagle Crest Elementary. Students noticed a large jump in electricity usage in the fall of 2015 after three portable classrooms were added to the site. To gain a clearer picture of this load, Magnelab Current Transformers were installed to isolate the portables. These units total a mere 1,400 square feet, yet account for almost 20% of the school’s total electricity usage. The green line in the graph shows the portable units which unequivocally bumps up the peak demand by 70 kW on this particular day. This information is a major factor in assessing the proliferation of portables throughout the district. Another valuable observation during the Resource-Wise program in November of 2016 took place at Westview Middle School when two teachers and their class found unusual spikes in the eGauge data. When digging further, the issue had to do with the chiller starting up due to high outside air temperatures. This led to a review of how best to mitigate the spikes while maintaining a desirable level of comfort for building occupants. By enabling the chiller to actually come on at a lower temperature of 55 degrees, thus earlier in the day, the spikes smoothed out and allowed the unit to work toward set-point more steadily. The eGauge showed a significant decrease in spikes with no accompanying increase in overall energy consumption. The energy club at Longmont Estates Elementary School found a critical issue through regular analysis of the eGauge data. The teacher asked the Energy & Sustainability Manager about a large additional weekend load which resulted in conversations with the HVAC Technicians around system programming. It became apparent that an RTU above the cafeteria was cycling on and off 24/7. If not for Resource-Wise and the accurate depiction of electricity data at the site, this small, yet costly issue could have remained unresolved for many months or years. There are many more examples of the operational and educational benefits stemming from Resource-Wise and the eGauge device including coil cleaning, extreme cold weather procedures, custodial training, building tune-ups, and renewable energy installations. The real-time data provides evidence to support energy efficiency projects and conservation policies and helps to uncover mechanical system problems and opportunities to minimize energy waste. These resources and tools also serve to equip students, teachers, and staff with the necessary skills to positively impact their environment. These real-world problem solving exercises effectively cultivate youth into sustainability leaders who will innovate groundbreaking ways to safeguard people and our planet’s precious resources. Since Resource-Wise began as a pilot in the fall of 2014, the district has clearly achieved utility savings and adopted conservation habits. The chart shows a reduction in energy use intensities (EUI) for participating schools versus those that have yet to join the program. The average kBtu/ft2/yr for participating middle schools has improved by 4% over their counterparts. The EUI for participating elementary schools has decreased by 11% in comparison to a 3% increase for non- participating elementary schools. The Energy & Sustainability’s Department’s resource conservation programs and energy efficiency projects are successful in large part due to the availability of effective tools and supportive mechanisms. With the use of Magnelab CT’s, SVVSD has benefited from accurate eGauge data which has launched countless innovation, education, and efficiency opportunities. Having insight into building management and learning how to positively influence the environment has become widely embraced by the community. As municipalities and corporations develop comprehensive sustainability plans, as energy codes require greater efficiencies, and as consumers demand eco-friendly products and services, the world will need well-equipped sustainability leaders. For those reasons, the district chooses to use resources wisely, free up funds for better educational purposes, and prepare students to be vital players in a rapidly changing green economy. Thank you to the teachers, staff, and students at Sunset Middle School, Eagle Crest Elementary, Longmont Estates Elementary, Westview Middle School and all the other schools for their commitment and feedback. Their input has been priceless in developing meaningful programs. Thank you to district HVAC Technicians, Electricians, Custodians, and other departments for providing guidance and help to implement changes. Also, thank you to Brad Queen with Cube Resources for his continuous support and technical assistance. And we are forever grateful to the Center for Resource Conservation for bringing ReNew Our Schools to SVVSD as well as their incredible work throughout the state of Colorado. Finally, we appreciate the equipment from eGauge and Magnelab that made our real-time electricity monitoring possible and opened so many doors for the district in pursuing energy and sustainability goals! To download a pdf copy of this blog, click here. Not only did this program drive measurable business outcomes for the schools, it also provided a valuable educational opportunity for the students and staff. Bravo! It would be interesting to compare the savings results in this district with others in the country. For example, St. Vrain is likely a geography where energy conservation and receptivity to resource reduction is already a topic on people’s minds. What would be the result for districts where this may not be the case?